B.E. / B.Tech engineering graduate in the disciplines of Electronics / Mechanical/ Electronics & Instrumentation/ Electrical & Electronics and Computer Science. Relevant post qualification hands-on industrial experience will be an added advantage. 3- year full time Diploma in any discipline with at least 60% aggregate marks from any institution recognized by the State Board of Technical Education. Post qualification relevant industrial experience will be an added advantage. Should have passed ITI (2 years duration) in the trades of Electronic Mechanic/R & TV /Electrical and Fitter. post qualification industrial experience in the relevant filed will be an added advantage. Date will be hosted on company website as and when decided. 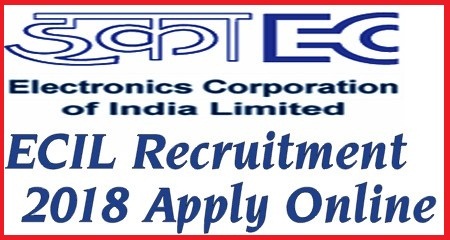 Eligible candidates have to apply ON-LINE through website “http://careers.ecil.co.in” for getting connected to advertisement details and online application or alternatively apply through our website: “www.ecil.co.in” by selecting ‘Careers’ followed by ‘e-Recruitment’. The on-line application process will be operational from 21.09.2018 (1400 hrs.) to 29.09.2018 (1600 hrs. ).